Benh Zeitlin arrives to Kustendorf 2013. Despite legions of advice to the contrary, there is no quick-fix scheme toward making a feature film. What it really comes down to is creating a universal story and surrounding yourself with people who believe in your vision enough to see it come to life. Benh Zeitlin proves that to make a powerful film today, you don’t need gimmicks, a convoluted strategy, or even connections in the business. All you really need is a story so strong that it’s impossible not to make. The 30-year-old Zeitlin’s journey from short to feature is a true fairytale in the landscape of American indie cinema. Working with a collective of artists called Court 13, Zeitlin created one of those rare game-changing shorts, Glory at Sea, which attracted the attention of the not-for-profit foundation Cinereach. They came on board to finance his feature, Beasts of the Southern Wild at a budget of $1.5M. What resulted was an ethereal film rich in emotion and breadth, unlike anything anyone had ever seen, earning 49 awards to date, and no less than four Academy Award nominations. Most directors can pinpoint the moment it all began. Zeitlin credits his directorial aspirations to watching the fantastically surreal Underground by Serbian great Emir Kusturica. Zeitlin’s journey came full circle when he found himself at the Kustendorf International Film and Musical Festival at Kusturica’s mountain utopia resort in Mokra Gora this year. Having heard rumors of the legendary festival, Zeitlin was thrilled to be a guest, and described the entire experience, from flying in by helicopter from Belgrade to clinking raki glasses with the director himself, as everything he could have dreamed of and more. We sat down with Zeitlin in the smoky underground Visconti restaurant to find out what one of cinema’s youngest and most powerful new voices has learned thus far. 1. Pay tribute to your heroes, in your own voice. I found a VHS copy of Underground in New York’s Kim’s Video, watched the movie three times in a row in my basement and thought at the time, this is what I want to do with my life. This is a way of making films that I’m actually interested in, as opposed to the Hollywood-industry way of making films. With Beasts of the Southern Wild, I went to this place, this dying region in the bottom of Louisiana. I saw the marshes falling off into the Gulf, as you see in the film. It reminded me so much of that last moment in Underground where the land splits and floats away. The initial inspiration of the film was very much that I wanted to make my Underground for this place, to make a film that’s a tribute to a place that we’ll never see again. 2. Your film must be a done deal. Only the journey is negotiable. The mentality for our feature was always that we were going to make the film, no matter what. There was never this thing where we were going to write the script and then wait till someone gave us the money. It was always we’re going to make it, and here’s the starting date. If we get the money we’ll make it bigger. If we don’t get the money we’ll shoot it with our cellphones. Our philosophy was whatever we did, we had to proceed with absolute certainty. That was probably crazy, but it had an effect. Money sort of follows determination. It was a big group of us and we were all very determined. A lot of miracles happened, but I think they happened because we were charging so quickly that it was almost like a boat shooting through the water. We created the current and the momentum. 3. Direct the camera just as another actor in your story. The camera work was one of the more tightly controlled elements of the film. We would talk about principles a lot and I would direct the cameraman like an actor. Rather than giving technical directions, he had to perform like a documentary cameraman. He was never allowed to pre-empt the action. He had to be reacting to the world in the same way that Hushpuppy did. If somebody was going to pick up that glass of water, if he moved the camera before the glass went, I would cut it and say you’re not listening, the same way you would tell an actor that he’s not listening to the other actors. He needed to respond spontaneously. 4. Find a story that anyone can relate to. I always thought that the films people love the most are the films that are wise, that have simple lives, truths and ideas in them. All my favorite films growing up, like E.T., have that quality. Hollywood tends to dumb down things, and be incredibly formal and simplistic and paint-by-numbers. And I never thought that is what people actually liked. But why those big Hollywood films were so successful—why they make so much money, why they are so universal—is that they have big important issues and essential wisdom in them. Our idea was to take some of the language of artistic, lyrical film, but to have the heart of it be wisdom and big questions and simple ideas and universal themes. I think that is one of the reasons why people see it as not an art film that’s trying to push you away, but one that is trying to draw you in. And it’s about things everyone goes through. 5. Stay true to the key theme of your film, every frame of every scene. There is one question that really centered everything: how do you lose the things that made you? How do you survive losing a place, losing a home? How do you survive losing a parent, not just physically, but emotionally? How do you maintain your joy and your smile and sense of humor and not get crushed by the loss, but at the same time face it? How do watch it slip through your fingers and have to still be alive after that, after something that horrible just happened? That is not just a question we had going in, but that was the rock that every scene had to be about, paying respect to that which is going away, and surviving the tragedy of it. 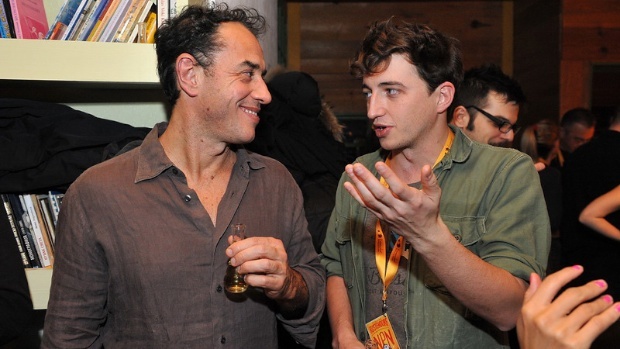 Director Matteo Garrone with Benh Zeitlin. 6. Direct truth, even in fiction. I think Court 13 is about living the story, about trying to create the actual feeling that you are trying to shoot on set. You want to shoot a party, you have a party. You want to shoot a flood, you go to a flood. Its trying to get the real thing on camera and emotionally too. There is a lot of slight-of-hand acting using real performances and real emotions. 7. The old Hollywood formula for what makes a successful film is dead. They just let us talk about it, not in a way you normally talk about a movie: “Oh its When Harry Met Sally meets Jaws.” They let us talk about the feelings, the emotions we were trying to create, the spirit, who this character was. They let us give this broad and wandering pitch basically and got behind that. 8. There’s no one-size fits all path toward making a feature. I think it’s really about making what you want to make. I think the place people run into trouble is when they start strategizing about how to make a feature, and then they’re making films in order to make the feature, when they should just be making the film at hand. I think inevitably you always have to be aware of your means and a lot of the time your means will dictate that your films will be short until someone pays for them. It’s about finding whatever story really moves you and you can speak about with wisdom and honesty. 9. Cinema is alive and thriving outside of New York and L.A.
There’s just so much out there. I think one of the real criminal things in the industry is that you see all these stories of somebody that wants to live in Los Angeles or New York, and there are all these other people in the world who are so talented. I think that exploring and trying to make films that come from different cultures that have different kinds of people in them is really important. The fact is that there are two industries: There’s the industry of making movies, and there’s the industry of making celebrities. And right now people don’t know how to break them apart, but they are actually two totally different things. The industry of making celebrities is obviously where the cameras are, where there’s glitz. The industry of making movies can happen anywhere, and it should. I think it’s important that film finds a way to free itself from that paradigm. 10. Filmmaking is an adventure. Treat it as such. There is an element when something gets in your head and you have to get it out. You get stuck on questions about the world that you don’t understand, and the way to learn about them is to make work about them. The reason I love making films is that you can write something that you want to do and in order to make the film you get to do that thing. So something you would never have a chance to do, like riding around in swamp boats in Southern Louisiana, which I’ve always wanted to do, you write it as a film then you get to do it. And you get to bring all your friends along on these adventures. I don’t think I would be able to walk into Pointe Au Chien, Louisiana and make 500 friends if I was selling insurance, or even if I was there doing interpretive dance. Film has this beautiful thing that everybody in the world loves and appreciates and it allows you to collaborate with people you otherwise would not be able to.